An early elutriation tower was invented by Lewis Jennings of New York and patented in 1849 (US #8,410). Today elutriation towers use a rising column of water and typically use a teeter (hindered settling) for recovery. However there are many types of E-tower and a systematic classification is long overdue. Around 1968 the United States Bureau of Mines began a Heavy Metals Program and awarded a research contract to the Minerals Industry Research Laboratory(MIRL) of the University of Alaska, to test and improve the recovery rate of -100 screen mesh gold in the Alaskan placer deposits. MIRL built a lab scale E-tower and ran hundreds of successful tests on placer material, and much of the findings were published. In the late 1980s ASAT continued the research andbuilt ASAT towers of several sizes (1-inch, 2-inch and 4-inch) for lab tests, de-sliming clean-ups and full-scale production. 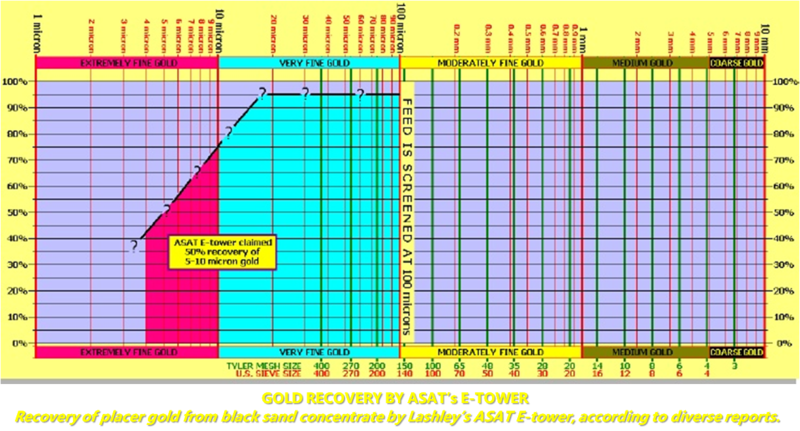 Walter Lashley of ASAT invented a superior form of elutriation tower (E-tower) in the 1980s that attracted considerable attention for its ability to recover fine gold. During the early 1990s an environmental mining equipment R&D group took over the testing on the E-towers from Walter Lashley and did considerable field tests and is reported to have made vast improvements on ASAT’s original design. Over 120 units were installed on several mining projects in the USA and Mexico and reported to have worked very well. An advanced form of ASAT E-tower is capable of recovering <5μ gold in a controlled environment in a lab,and can recover 50% of <10 μ in field experiments whichis significantly better than most other recovery devices. Variants of E towers relevant to simple recovery of fine placer gold include the ‘Gold Funnel’ of RodneyCharles Christensen of California patented in 1997 (US#5,692,620). Clean water is introduced into a 1-inch, 2-inch or 4-inch diameter column either near its base or part-way up,at a controlled rate as determined by experiments. Rising up inside the column, the water enters a teeter zone characterised by hindered settling. Finely screened concentrate (e.g. <0.2mm) isspooned into the tower from above and falls through therising water down as far as the teeter zone. Extremely dense particles such as gold fall through the teeter zone to accumulate in the bottom of the device as a lag deposit to await batch discharge Fairly dense particles accumulate as a hoveringfluidised mass (teeter bed) in the teeter zone. The continuous arrival of new particles from above into the teeter zone causes particles to become increasingly crowded and then only hindered settling can occur. The hindered settling means that dense only dense particles can get to the base of the teeter bed, and indoing so they eject upwards less dense particles. As a result the teeter bed becomes vertically stratified with the densest particles at its base overlain by lighter particles. The lighter particles are vulnerable to ejection with the rising water as tailings whereas the heavier particles are protected from scouring away by the carpet of lighter particles resting upon them. After processing many spoon fuls of material, the enriched gold concentrate is siphoned off from the device. Osterberg’s E-tower was invented by Daniel Osterbergof California, patented in 1984 (US #4,451,359), and marketed as the Quick Gold Separator. The device causes black sand to fluidise and particles to hover. For ‘hovering’, the water velocity has to slackenupwards – impossible in a cylinder is of uniform diameter. Slackening is by the water escaping from the constricted space in the flow distributor. If a teetered bed E-tower then hovering is accompanied by hindered settling in the teetering fluidised bed, displacing lighter particles upward. The author suggests that Osterberg’s device is amultiple E-tower with many rising columns jetting upward,each decelerating once free of the flow distributor.Osterberg’s E-tower seems capable of achieving highpercentage fine gold recovery and merits testing. Screened concentrate is spooned into the tower from above. The water rises with enough velocity to non-turbulently fluidise the concentrate yet without ejecting particles with the overflow of wash water.The upwelling water must decelerate for black sand to hover as a fluidised bed, the deceleration being due to the rising non-turbulent plumes of wash water have more width once free of the flow distributor, suggest the device is nota teetered bed settler as hindered settling seems minor. The patent suggests the fluidised bed be stirredgently at the start to encourage gold to fall to the bottom. The upper portion of the fluidised bed is deemed to be depleted of gold and is siphoned off as tailings. The dense gold particles remain behind and more concentrate is spooned into the top of the column. After processing many spoonfuls of material, the enriched gold concentrate is siphoned off from the device.